A few nights ago, Samsonite surprised me with an unexpected tweet. They didn’t give me a free luggage. (Oh, that would have been the best! Haha) They simply took time to recognize my melancholy but hopeful sentiments. Let me relate the entire story behind the surprising tweet. My usual day ends by checking my Facebook and Twitter accounts. I bring my iPad in bed and before going to sleep, I made an emotional tweet. So how and why did I suddenly become emotional and sentimental over a piece of luggage? In a few more weeks, I’m bound to make my next travel adventure. Despite planning way ahead of time, I still have issues and problems to settle. This has been plaguing me over the past days. I’m already considering cancelling my trip but deep inside, I know that retreating will never be an option. Never! One of the sources of my problems is the search for the great luggage that will serve as my reliable companion. In the past, I'm shy to admit that I always borrow my friend's luggage. My past trips abroad always meant relying on Anne's luggage and kindness. I wanted to acquire my own luggage but as much as possible, I don't want to purchase anything except for my dream Samsonite Cosmolite series. I particularly wanted the Cosmolite in red. A little information about Samsonite's Cosmolite is its very light weight at 2.2 kgs. Wow! The scratch free feature and elegant shell like structure won my heart. The fact that it's also Samsonite, I know that the brand carries quality. 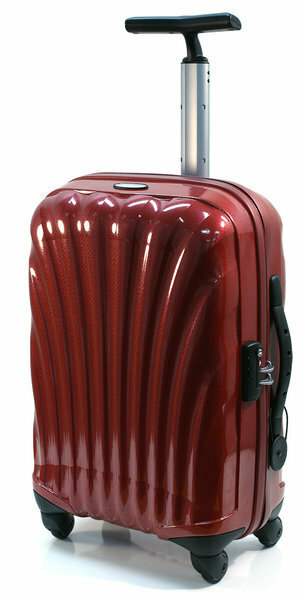 You might be wondering, why did I end up coveting one of Samsonite's Cosmolite collections. Everything was influenced by my addiction to the Korean drama series, My Princess. For those who are reading my blog for quite some time, you might remember my post about my addiction to My Princess. In the entire stretch of the episodes, this red Samsonite luggage made significant appearances. Thank you recognizing my emotional outpour. Thank you for treating me like a valuable existing customer. I will work harder to purchase my own Red Cosmolite. Aside from serving as a reliable partner, my future Red Cosmolite will serve as a companion and instrument to my succeeding travel adventures. the red Samsonite sure looks durable! I like durable luggage. I haven't seen this style before. Mine is just an old no-name black one. Have you seen the handlers throw the luggage? No wonder they get damaged! I'm intrigued about your upcoming trip...are you excited? Hi Diane! That luggage does look pretty. Once upon a time, I really wantedm to purchase a fuschia pink one, haha. Hubby talked me out of it because we share everything and he will never be able to borrow a fuschia pink luggage :) Can't wait to see where you will go next.